Jat Airways is the national airline of Serbia and the former national carrier of Yugoslavia, based at Belgrade Nikola Tesla Airport . It operates scheduled domestic, regional and international services to 32 destinations in Europe, North Africa and the Middle East, as well as charters and wet leases. The fifth JAT Caravelle SE-210 was welcomed at Split Airport by several thousand people. The airplane was named "The City of Split". The company was founded on 17 June 1927 as Aeroput (Аеропут). Its first international flight was in 1929 between Belgrade and Graz (Austria). In 1937, the expansion of international routes and an increase in passenger numbers enabled Aeroput to acquire the Lockheed Model 10 Electra. Aeroput continued to operate until the Second World War. On 1 April 1947, the name was changed to JAT - Jugoslovenski aerotransport (Југословенски аеротранспорт), then to JAT Yugoslav Airlines and finally to Jat Airways in January 2003. In 1946, it was apparent that, due to the nature of its tasks, the Yugoslav Air Force would not be able to become involved in the nation's post-war build-up of civil aviation. Consequently, preparations were made for the formation of an air transport company. Three C-47 military transport planes and three Junkers Ju-52 (capturedduring the war) were flown to Czechoslovakia to be converted into passenger aircraft. The name chosen for the new airline was JAT - Jugoslovenski aerotransport. In 1949, Yugoslavia was faced with a dire international position: isolated both by the West and the East. This caused further rationing of fuel, difficulties in procuring spare parts and the cancellation of all flights to Eastern European destinations. JAT was forced to survive on 6 domestic lines. When Yugoslavia turned to the West, an agreement was made with Swissair to open the Belgrade-Zürich route, which was inaugurated on 24 August 1949. Company stagnation marked the operations in 1949, because the traffic volume was well below fleet potentials and transport needs in the country. However, 1950 was in many ways a turning point. Douglas DC-6B were bought for long-haul routes, and Convair CV-340 / CV-440 aircraft for short-haul routes. Multiple international and domestic routes were opened. In 1963, the first Sud Aviation SE-210 Caravelle 6-N jet aircraft joined the JAT fleet. In 1969, the first McDonnell Douglas DC-9-32 jet (of 16) arrived, followed in 1974 by the first two (of 9) Boeing 727-200 aircraft. Long-haul routes to North America, Australia and the Far East were flown by Boeing 707s, introduced in 1970. In 1978, a wide body McDonnell Douglas DC-10-30 (which was chosen over the Boeing 747-200) was purchased to succeed the Boeing 707s on the longer-haul routes, although the 707s stayed in service into the 1980s on ad hoc charters and as scheduled-flight replacement aircraft. Purchase of the DC-10-30 wide-body aircraft was followed several years later by the purchase of a medium-range aircraft. In 1985, JAT was the first European airline to purchase Boeing 737-300s. During those years, the company carried 5 million passengers annually and served 80 destinations on five continents (19 domestic, 45 medium haul and 16 long haul routes). JAT also constructed a large hangar to accommodate wide-body aircraft and a jet-engine test stand at their Belgrade hub. In 1992, the Socialist Federal Republic of Yugoslavia broke up and the Yugoslav wars started. As the national carrier of the Federal Republic of Yugoslavia, and disintegrated by the civil war, JAT was forced to stop all domestic services. Resolution No. 757 passed by UN Security Council on 20 May 1992 resulted in economic sanctions against Serbia and Montenegro. For the first time since World War II, international transport was forcibly terminated. This was preceded by the decisions of Germany and Italy to interrupt any traffic with Yugoslavia: on 21 December 1991 - Germany (the largest market for JAT in Europe, with 7 flights daily and 40 million German marks gross annual profit), followed by Italy on 10 January 1992. The US introduced the embargo on air traffic with Yugoslavia on 2 May 1992: the last JAT flights to America were to Chicago and New York City. That day, the JAT management decided to re-route North American long-range flights to Canada . However, Canada immediately copied the actions of the USA, and operations across the North Atlantic finally had to be terminated. During that time, JAT operated only domestic services between Belgrade , Podgorica , Tivat , Niš , Pristina and - for a very short time - Užice-Ponikve Airport (many of these were money-losing destinations). Finally, in 1994, JAT resumed some of its international services, with aircraft in a new livery (after EU lifted the air embargo). In 1998, JAT ordered 8 Airbus A319, this was seen as a political stunt by the president. The original delivery date was June 2000 but this date has been postponed until a total of $23.5 million is paid off to Airbus while Jat is hoping to divert the deal to another airline. Soon after all flights were cancelled as Europe introduced a new ban and Yugoslavia was bombed for 78 days. In April 2000, director general Žika Petrović was killed in a mafia-style execution, in front of his family home in Belgrade ..
At the beginning of 2007, Jat Airways was negotiating with Airbus in order to change the deal (6 Airbus A319 and 2 Airbus A318 instead of 8 Airbus A319). After the regime's overthrow on 5 October 2000, the FR Yugoslavia was accepted back into international organisations and sanctions were dropped. JAT was given the rights to fly across the continents. To celebrate the move that coincided with the country restructuring from FR Yugoslavia to Serbia and Montenegro, Yugoslav Airlines modified its name to Jat Airways on 8 August 2003. The airline resumed service to destinations across Europe, Asia and Africa. Jat sold its last McDonnell Douglas DC-10-30 with the registration YU-AMB named as the "City of Belgrade" on 24 June 2005 to Nîmes , France based company TAT Industries for dismantling aircraft for spare-parts. During 2005, the company also phased out all Boeing 727 and DC-9 aircraft. The last airworthy McDonnell Douglas DC-9-32 with the registration YU-AJK was leased to the United Arab Emirates company Eastern SkyJets. The DC-9s were to be replaced with 2 leased CRJ-700 aircraft scheduled to arrive at the end of 2006, but did not, because government representatives did not want to sign the documents. The company had plans to restart long-haul operations to North America Chicago , New York City , Toronto and Montréal in June 2005 with two leased Boeing 767-200ER aircraft but these plans were postponed. Jat then intended to re-start the flights to New York City in May 2006 and to Toronto in June 2006 with a leased Boeing 767-200ER aircraft from Polet Airlines, but were never given rights to fly to the destinations. Jat has since received the rights to fly to Canada . Jat Airways is not a member of any alliances or partnerships but does code-share on some routes with Lufthansa , Austrian Airlines, Alitalia, Aeroflot, B&H Airlines, Czech Airlines and Montenegro Airlines. Jat Airways also has a special prorate agreement (SPA) on flights to and from Australia with Etihad Airways via Abu Dhabi . Jat Airways introduced its online booking system in September 2006 and electronic tickets in April 2007. Jat Airways celebrated 80 years of service on 17 June 2007. In 2007 and 2008 the airline received an award as one of the five best brands from Serbia. It also received an award for its television advertisements celebrating 80 years of service. On 3 July 2008 the Serbian national carrier reastabilished air links with Croatia after a 17 year absence. and are also planned for the 2009 season. In early 2009, the management of the airline announced its initiative of taking over a majority share in the debt stricken national carrier of Macedonia , MAT Macedonian Airlines. An agreement on the amount of shares to be privatised and bought by Jat Airways should be finalised during the summer of 2009. The management believes that by taking over the Macedonian airline they will be able to gain a major share in the Macedonian aviation industry. Due to competition in the Serbian market, the Serbian Government (Jat Airways owner) considered privatization as an option for future development of the airline. On 25 May 2007, Velimir Ilić, Minister of infrastructure said that Russia's Aeroflot has so far made the most concrete offer for the purchase of a portion of Jat Airways. Aeroflot offered to keep all Jat Airways employees, settle any debts and buy new airplanes for regional routes. Reports claimed that Aeroflot was prepared to invest USD 450 million in Serbia's Jat Airways. Aeroflot is also interested in commencing flights to more cities in Serbia. A delegation of Icelandair visited Belgrade as they were also interested in privatization of Jat Airways. Also interested in the privatization of Jat Airways were Air India, Air Berlin and Air One. In September 2007, the technical consulting and joint bid by: Rothschild & CIE, Clyde & CO LLP, Citadel financial advisory, Aviation Economics and Dekonta became Jat Airways’ financial advisors. They monitored and suggested the best privatization offer. On January 16, 2008 it was announced that the government of Serbia will sell 51% of shares. On 31 July 2008, the tender for the sale was announced. Investors were able to submit offers for buying a minimum of 51% and a maximum of 70% of shares. Companies participating in the purchase had to provide an Air Operators Certificate (AOC). Interested investors were be given a deadline of nearly two months, until the end of September, for submitting binding offers. The starting price for the airlines 51% share was 51 million Euros, decreased from the earlier announced 150 million in order to increase interest. On 30 September 2008, it was announced that no company had sent in an offer for Jat Airways and as a result the company would not be privatised. It was announced that the Serbian government would remain the sole owner of the airline with added investment, restructuring and modernisation. The airline is wholly owned by the Government of Serbia and has 1,838 employees. When the name Yugoslav Airlines first appeared on aircraft in 1950 the airline had a simple, mainly white livery. During these years there was a Yugoslav flag on the tail, and on the body the words Yugoslav Airlines. Shortly afterwards the airline changed its livery, when the word on the tail section with a red shaped egg on the tail in which JAT was written in white colours. The rest of the tail was blue, with Yugoslav Airlines written on the fuselage in red. There were variations of this livery during the 60s, 70s and 80s. The biggest change in this period was when the first Boeing 737-300 aircraft arrived with a silver body. As the 1990s approached, JAT changed the look of the aircraft again. All aircraft were repainted, with the tail section receiving a flame-like blue, white and red colour - the colours of the Yugoslav flag. For the first time, the word JAT was written on the aircraft, in block blue letters along with Jugoslovenski Aero Transport, which were written in silver italics. Later, the livery was modified, with the Jugoslovenski Aero Transport tiles changed to small blue block Yugoslav Airlines tiles. The remaining DC-10 had Yugoslav Airlines tiles written in italics on the fuselage with silver colour. The logo also changed from the egg to the flame. In 2003, the airline changed its name to Jat Airways. A national competition was held to design the new logo and livery. The winning design had 3 dots on the tail: blue, red and blue. The fuselage of the aircraft had a large Jat Airways written on it, with Jat in red and Airways in blue. The new logo was the name Jat Airways written with 3 dots in blue, red and blue following it. Jat Airways painted only one aircraft in these colours, a Boeing 737-300 with the registration YU-ANJ. Jat started painting its aircraft all white and in 2006, most aircraft were white with a small Jat Airways logo. In December 2006 the airline decided to return to its dot livery. By August 2007 all aircraft have been painted. The livery is slightly different from the previous dot livery. It has the dots on the tail, but the small jat titles remain rather than the big Jat Airways logo across the fueselage. 2 new aircraft to the fleet, a Boeing 737-700 to use to the Middle East without a stop over in Larnaca , due for delivery in March 2010 and another leased Boeing 737-400 for services to London , Paris , Moscow and summer charter destinations. Fix all grounded aircraft (a total of 4) and have their aircraft leased to Air Ivoire returned. A new subsidary to be based in Macedonia . Aeromak is the decided name and is to launch operations before March 2010. New destinations; 1 in the Middle East, Dubrovnik and Pula in Croatia as well as relaunching summer charters to Portorož . Join one of the 3 major airline alliances; SkyTeam, Star Alliance or Oneworld, with SkyTeam looking the most likely. New look at Jat Airways from April 2010. Jat Catering, although a 100% owned subsidiary of Jat Airways, is a standalone operation responsible for its own economic infrastructure, management and profitability. Under the guidance of its chief executive officer, the company’s prime responsibility is the preparation of in-flight meals for Jat Airways. It also caters for foreign airlines, among which are Aeroflot, Air France, Olympic Air and Swiss International Air Lines. Jat Catering offices and kitchens are situated in the industrial area of Belgrade Nikola Tesla Airport . For commercial airlines the company also makes special meals for vegetarians, toddlers and vegans. The aircraft of Jat Airways are fitted out in a two-class configuration. In the Boeing aircraft, Jat has a business-class section and an economy-class section. On ATR 72 aircraft, the airline offers a one class all economy configuration with the business class section, which used to be located in the back removed in mid 2008. Every passenger gets a complimentary copy of Jat’s in-flight magazine “Jat Airways Review”. All drinks, food and duty-free items are available during flight. Includes copy of Jat Airways Review Magazine, cloth seats with limited reclining capabilities, and stowaway tray tables. From June 2009, the airline began refurbishing its B737-300 economy class section by replacing the seats. By August 2009 a total of 7 aircraft will operate with the refurbished look. Includes copy of Jat Airways Review Magazine, large black leather seats with limited reclining capabilities, and stowaway tray tables. "A Trip More" is the name of the Jat Airways Frequent Flyer Programme. If passengers fly with Jat on five return or ten one-way international flights in a twelve-month period passengers will gain a free round-trip flight with the ability to make a reservation. Jat Airways passengers who are participating in the Lufthansa programme "Miles & More" can earn miles flying Jat Airways on select routes between Serbia and Germany. Jat Airways organizes individual and group charter flights on all types of Jat Airways aircraft, both domestic and international. The users of this service include tourist agencies, sports teams and fans, artistic groups and ensembles, as well as participants of congresses and fairs. Most charters take place during the summer to the Greek , Turkish , Egyptian , Tunisian , Spanish, Italian , Portuguese , French and Bulgarian holiday resorts. 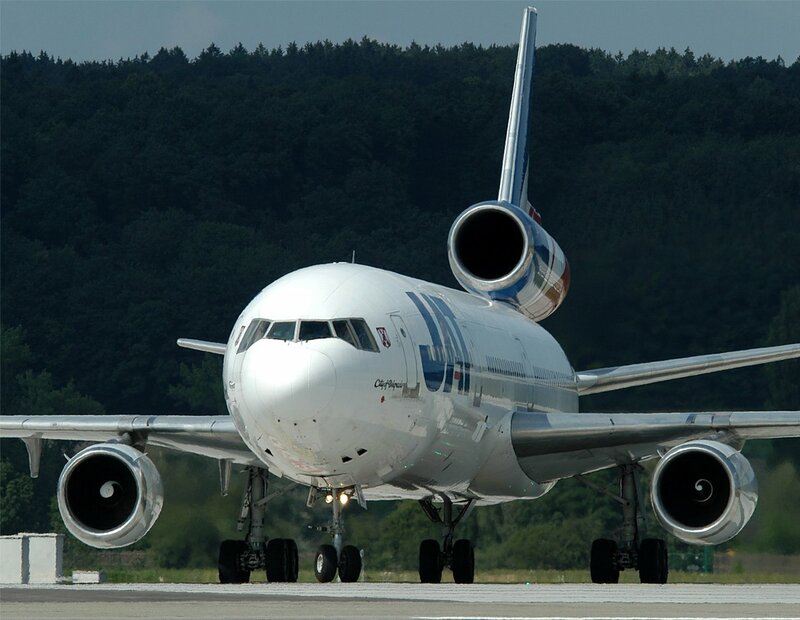 Jat Airways offers cargo services on all destinations in its network with special cargo only flights to Podgorica and Tivat in Montenegro (due to high demand). However Jat also operates these two cities as passenger flights. Although a separate company from Jat Airways, Jat Tehnika is a services and maintenance company for Jat's fleet and other airplanes used by regional carriers, like CSA Czech Airlines and Transaero. During the winter season (25 October 2009 - 27 March 2010), Jat Airways flies to 32 scheduled international destinations in 23 countries (at October 2009). Jat Airways has announced that it will commence negotiations with Bombardier, Embraer and Sukhoi for the purchase of four new aircraft through a financial lease in the first quarter of 2010. Furthermore the airline is also planning to revitalise its fleet within the next four years by purchasing five new ATR 72-600 turboprop aircraft and three Boeing 737-700 aircraft. The investment will be worth 50 million Euros. The Aeroput MMS-3 (reg. as YU-SAR) became the first passenger aircraft made in Serbia in 1934 year under Aeroput's brand name. Also Aeroput ordered two Spartan Cruiser II aircraft and a licence to build further examples. In 1935 one Cruiser II (reg. as YU-SAP) was built under Spartan's licence for Aeroput by Zmaj aircraft company in Zemun . In 1953, JAT began organising their flights with the introduction of flight codes. The first code, JU720 was used on the Belgrade -Zagreb -Ljubljana route, while the return flight took the code JU721. Towards the end of August 1959, JAT transported its millionth passenger since the founding of the company back in 1927. A JAT Boeing 727-200 flew around the world. Commencing on the 10th of November 1974, the flight took 19 days to complete, flying: Belgrade -Beirut -Bombay -Singapore -Tokyo -Honolulu -Los Angeles -New York -London -Belgrade . Jat Airways was the first operator of the Boeing 737-300 aircraft in Europe. It arrived at Belgrade Nikola Tesla Airport on 8 August 1985 as YU-AND. Jat Airways was to become the first operator of the McDonnell Douglas MD-11 aircraft. However, due to the break-up of Yugoslavia and the imposition of sanctions on Serbia, the aircraft were never delivered. In 2004, Jat Airways was named one of the safest airlines in Europe by IATA. Former JAT flight attendant, Vesna Vulović, holds the world's 4th-longest fall record when she fell from 10,160 metres (33,333 ft) with no parachute and survived. YU-AJN None The aircraft crashed 1 mile short of the runway after losing visual contact while on an approach at Belgrade Surčin Airport . None of the 50 passengers were hurt. YU-AGG None The aircraft overran Stockholm 's Arlanda Airport runway 26 while landing in a thunderstorm blowing several tyres and receiving mud in all 4 engines. There were no fatalities in the incident. YU-ANV None The aircraft overran Istanbul 's Ataturk Airport runway while landing en-route from Belgrade by 50 metres. All 125 passengers and six crew were safely evacuated. 27 Flight JU 367, McDonnell Douglas DC-9-32 was destroyed in flight by Émigré Croat terrorists (Ustaša) who had placed a bomb on board. Of the 28 passengers and crew members on board, 27 died, with flight attendant Vesna Vulović the only survivor. YU-AHD 41 Caravelle Maganik Crash-This is JAT's most recent accident with loss of life. The aircraft struck the Babin Zub peak on Maganik mountain near Podgorica , at 6,300 feet while descending from 9,000 to 6,000 feet in IMC conditions on flight from Skopje to Podgorica , killing all 41 passengers and crew members on board. Allegedly, the flight was instructed to start descent, althrough the aircraft was not visible on radar (which were allegedly not working well at the time) nor could the control tower staff on Podgorica Airport make visual contact with the aircraft. "Jat" zaledio kupovinu aviona, kamate rastu | Glas javnosti, www.glas-javnosti.rs (Serbian). Jat od 3. jula leti za Pulu | b92.net (Serbian). Jat zabeležio gubitak od 25 mil. € | b92.net (Serbian). Jat Ervejz i MAT postaju strateški partneri | Poslovni Magazin (Serbian). Preuzimanjem MAT-a dobijamo značajan deo makedonskog tržišta | Danas (Serbian).